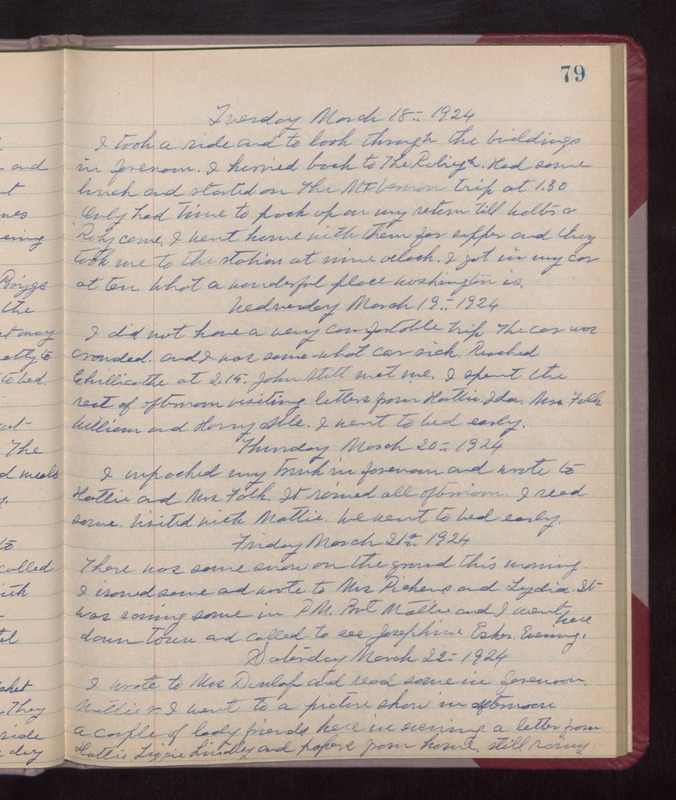 Tuesday March 18th 1924 I took a ride and to look through the buildings in forenoon. I hurried back to The Raleigh. Had some lunch and started on the Mt Vernon trip at 1.30. Only had time to pack up on my return till Walter & Ruby came. I went home with them for supper and they took me to the station at nine oclock. I got in my car at ten oclock. What a wonderful place Washington is. Wednesday March 19th 1924 I did not have a very comfortable trip. The car was crowded and I was some what car sick. Reached Chillicothe at 2.15. John Stitt met me. I spent the rest of afternoon visiting. Letters from Hattie, Ida, Mrs Falk, William and Harry Able. I went to bed early. Thursday March 20th 1924 I unpacked my trunk in forenoon and wrote to Hattie and Mrs Falk. It rained all afternoon. I read some. Visited with Mattie. We went to bed early. Friday March 21st 1924 There was some snow on the ground this morning. I ironed some and wrote to Mrs Pickens and Lydia. It was raining some in PM. but Mattie and I went down town and called to see Josephine Esker. Evening there. Saturday March 22nd 1924 I wrote to Mrs Dunlap and read some in forenoon. Mollie & I went to a picture show in afternoon. A couple of lady friends here in evening. A letter from Hattie, Lizzie Lindley, and papers from home. still raining.